SILVER and GOLD PRICES dropped again today, silver by 14.1 cents to $15.295 and the GOLD PRICE by $1.90 to $1,153.30. 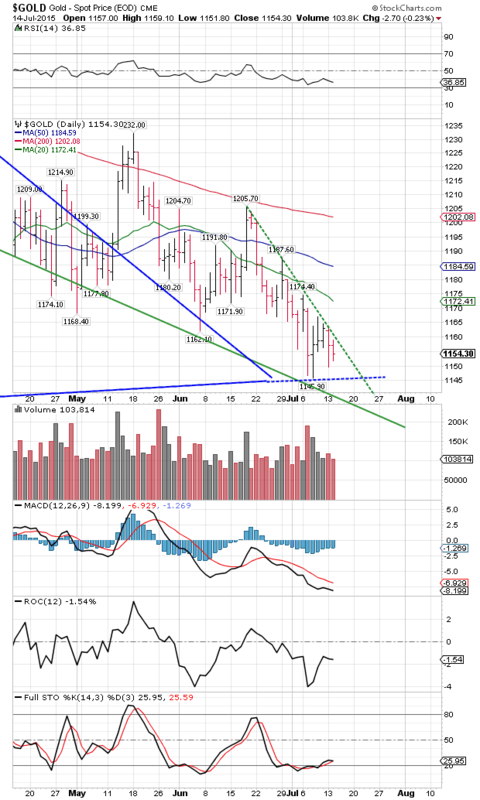 All the same, the price of gold has formed a bullish falling triangle (chart on the right). I say “bullish” because these triangles usually resolve upwards. A close tomorrow above $1,160 breaks the gold price out of that wedge. A fall through $1,130 would, too. 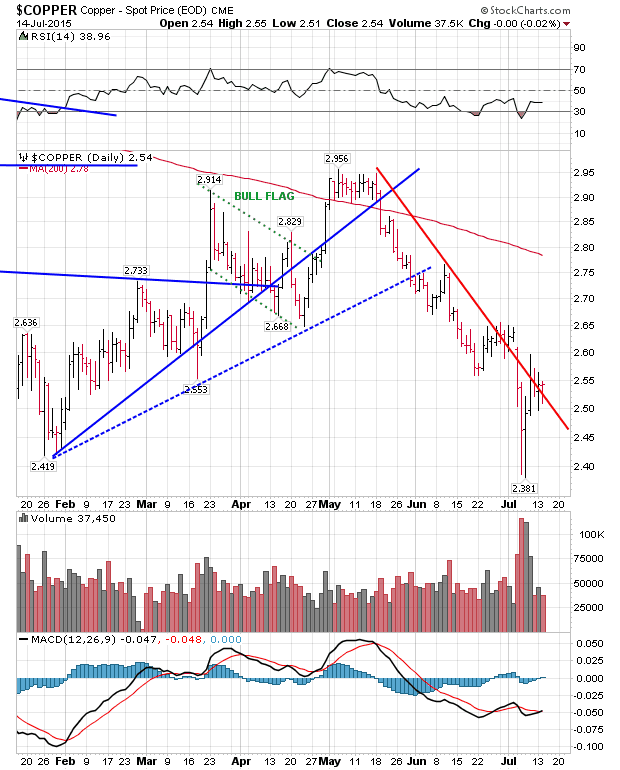 In the days since silver’s 7 July low it has formed an even-sided triangle (chart on left). Silver is trying to turn up, but what happened today? Tomorrow will literally push silver out of that triangle, one way or the other. 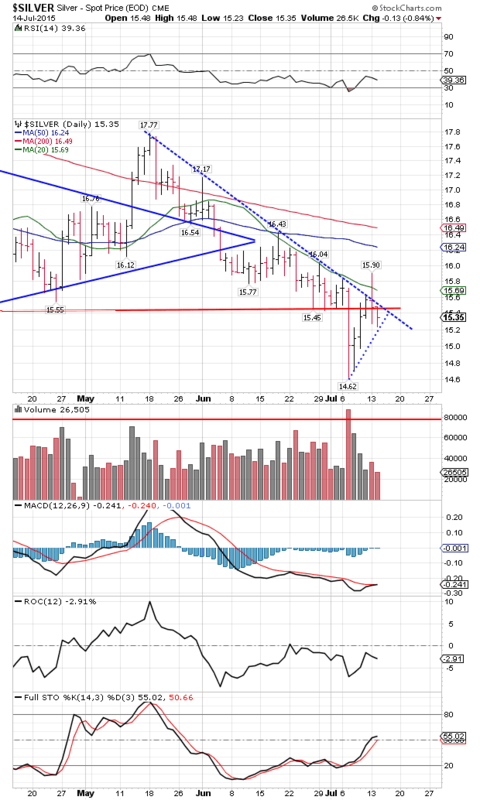 Today’s close below the $15.50 support was not encouraging. My operating theory in the teeth of all the calls for a gold price at $750 and silver price at 800 cents remains that you are now witnessing, or have just witnessed, the intersection of several cycles with the seasonal lows in silver and GOLD PRICES. 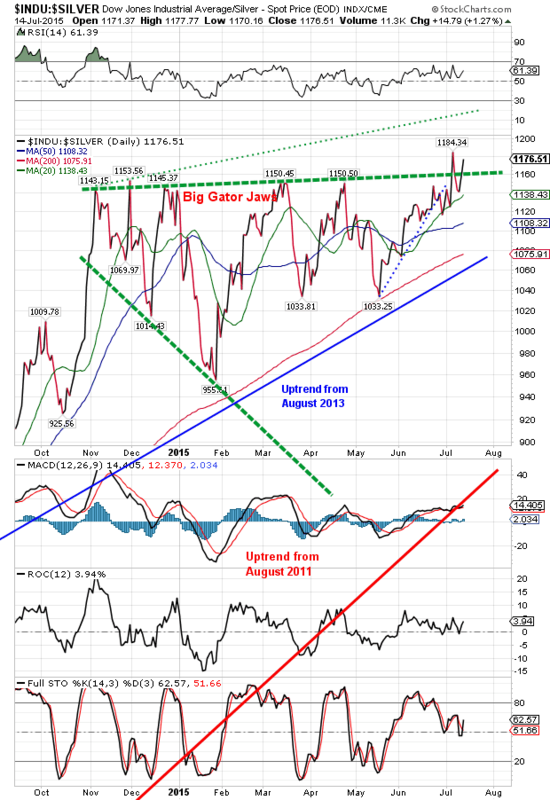 This ought to mark the lows in the bear phase that seized silver and gold after the 2011 highs. I may be left looking stupid, but I won’t lack an opinion. To understand the world’s present financial and government system, you must understand the concept “harvesting.” Harvesting occurs when the Tapeworm (the economy and government run by governments and central banks for the banks and their owners) slowly consumes its victims, bleeding them bit by bit until consumed. Think of a vampire keeping its victim alive to make the meal longer and more thorough, or a spider slowly sucking the life juices out of the enwebbed fly. For instance, the United States imprisons more people than any other country. Keeping prisoners has been turned into an industry that pays the criminal justice system and the prison industry (a lot of it privatized, remember, and contracted) and provides jobs for all those folks. Inmates are slowly consumed as they travel through the revolving door of prison and outside, until finally, having squeezed all possible juice out of them, the system discards them. I’m only a durned nat’ral born fool from Tennessee, but I’ve seen “privatization” before. It is a type of “harvesting” where state owned assets are sold off to Insiders at bargain basement, nickel-on-the-dollar prices, under cover of “freeing” the market. Yes, that’s right, it’s a corporate takeover. The Euros are asset-stripping Greece. Having enslaved it by debt, they are now “harvesting” the country entire, asset stripping it. And y’all thought slavery was dead — now they’re enslaving whole countries. There really is no limit to Our Masters’ gall. Oh, mercy! After I wrote the above this morning, a Greek friend sent me this article from ekathimerini.com describing the bailout, http://bit.ly/1K4QvZw It’s all far worse than I thought. The Euros have literally seized control of the country and its government. They’ve re-poed the whole country. It really frustrates me to see market after market behaving abnormally. They break out, then utterly refuse to carry through. Take, for example, the US dollar index on the right. 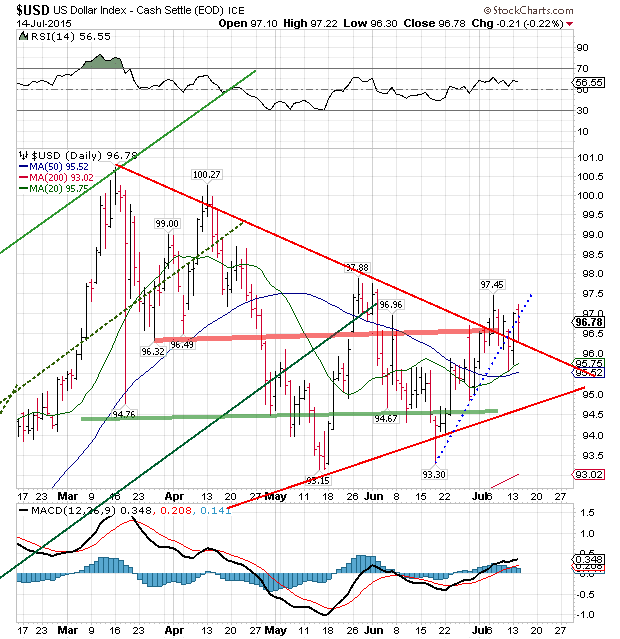 The Dollar index broke out topside of an even-sided triangle on 7 July, strong breakout, influenced by the Greek drama. Next day it tucks tail and runs back into the triangle. It breaks out again. Tucks tail again. Breaks out again, even on news of a Greek settlement, then breaks down today. Now maybe that’s nature working, but doesn’t seem so when it plays out against the backdrop of a long, strong rise, making the last 4 months look like a consolidation in an uptrend. I’m not saying this is the explanation, but it would exactly that same way if the central bank NGM were manipulating the dollar’s exchange rate downward. But the same failure to follow through has also happened in stocks and in silver and gold prices. Maybe the confusion and indecision is so widespread that no market (except sometimes stocks) can build much momentum. Today the US dollar index made a key reversal’s first half, trading into new territory for the move but closing lower than yesterday. That would have to be followed by a lower close tomorrow to confirm the reversal. Dollar index lost 21 basis points (0.22%) to 96.78. Euro rose a miniscule 0.5% to $1.1011. Couldn’t rally if you filled its tank with jet fuel. Properly chastened for attempting to rally, the yen is cowering under its 20 DMA. Lost 0.07% today to 81.04. US ten year note yield has retraced its steps to the downtrend line from 2007. ‘Twould be hernias and kidney stones for the Fed if the yield breaks above that and bursts the bond bubble. 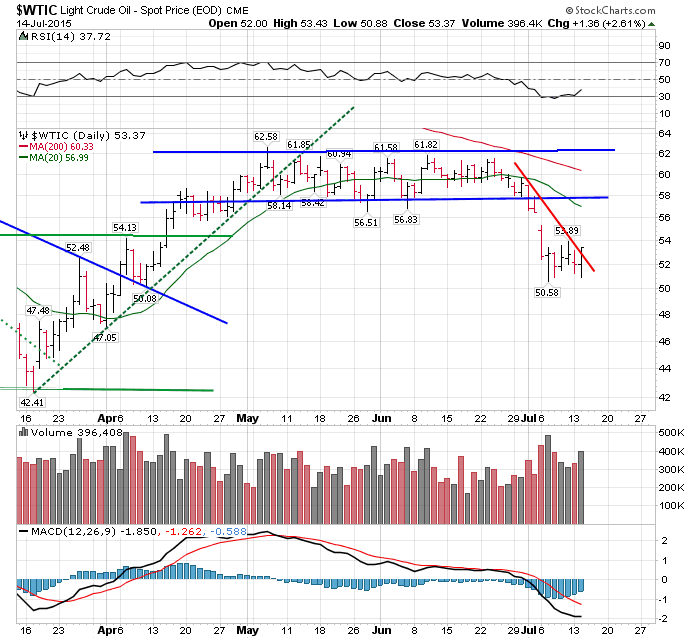 Oil (WTIC) is another market that broke down and has refused to carry through. Today it peeked its greasy head above the downtrend line, chart on the right. Copper made a V-bottom but can’t decide to rise, Chart on the left. In this best of all possible worlds, as Candide would say, stocks are a-blowin’ and a-goin’. Dow crawled over 18,000 again, rising 75.9 points (0.42%) to end at 18,053.58. Not to be outdone, the S&P500 rose 9.35 (0.45%) to 2,108.95. The pattern? 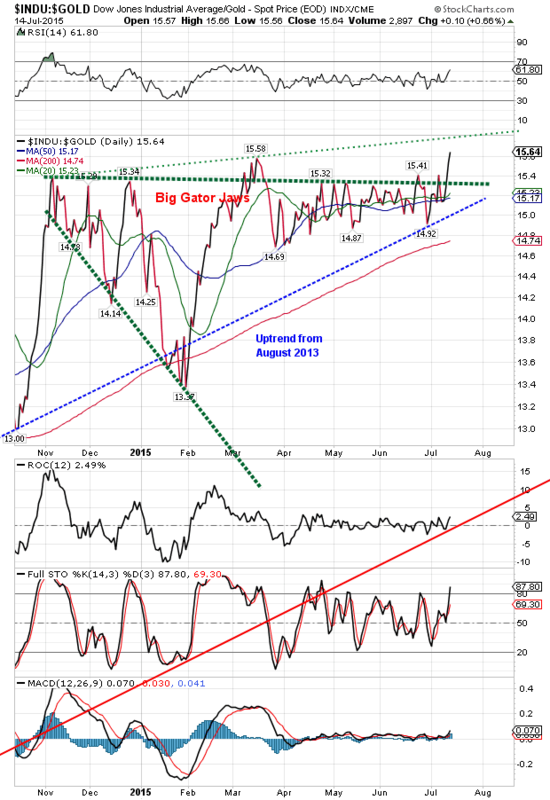 Broadening tops within broadening tops, emphasizing and re-emphasizing that stocks are rolling over. Oh, my goodness. Dow in Gold rose 0.66% today to a new high since the 2011 low. Put away your flask, I don’t need a drink. I am perfectly calm and this is all in order. High since these gator jaws (broadening top) began forming last November has been 15.58 oz, which at 15.64 oz today was bested by 0.4%, a rounding error. Might go higher. Look at the chart on the right, I re-drew the top gator jaw to take in that March high. Today’s high was no place near that line, about 15.80.